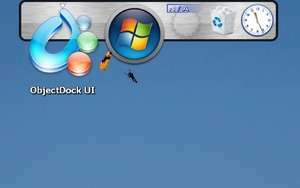 ObjectDock is a freeware, Mac OS X-style dock for Windows which includes an icon bar, access to files and folders and also provides quick access to useful utilities. Using this dock for Windows is extremely easy: all you have to do is drag the icons which you would like included onto the ObjectDock icon bar. Similar to Linux and Mac OS X docks, this one includes smooth transitions when you hover your mouse over the icons it displays. Hovering over icons also reveals a label describing the icon. For security reasons, you should also check out the ObjectDock download at LO4D.com which includes virus and malware tests. Additional screenshots of this application download may be available, too. 4.83 out of 5 based on 6 ratings. ObjectDock has a presence on social networks.